AFTER spending a night alone facing sleet, snow and torrential rains with no food and little water Peter Bowring had decided his time was up. 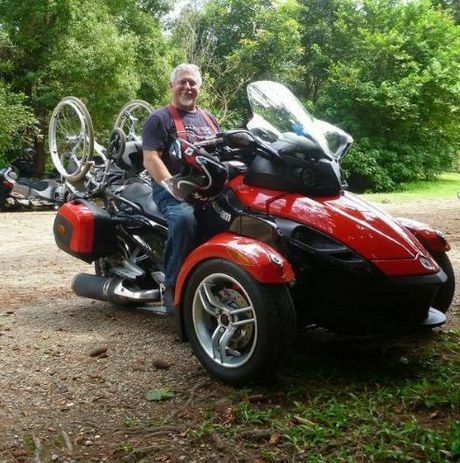 The Albany Creek man, who uses a wheelchair, had been enjoying a motorbike ride near Queen Mary Falls at Killarney on Thursday afternoon when a wallaby jumped onto the road at 3.45pm. Going 40km/h, Mr Bowring, 62, said he braked at a medium pace to 20km/h, but for some reason, the braking or weight of the machine, the road became loose underneath him. Mr Bowring knew his bike was going off the edge of the road, what he didn't know was that steepness of the decline, which he estimated was 70 degrees. "Literally what happened was I almost fell through the air," he said. "The bike took out two small trees before it was obvious the third was going to stop me, so I flung myself off to the right." After the bike became lodged in a tree, Mr Bowring continued to fall with the slope for another 30-40m before falling 10m from the canopy of trees to the ground. But he wasn't giving up, determine to get back up to his bike he used a pocket knife to cut through thick vines and dragged himself up the almost vertical incline for the next 12 hours with a fractured ankle and 'effectively useless' legs. "I was physically and emotionally shattered and so cold I was moving as though I was having an epileptic seizure," he said. "When the bike hit it had all its lights on, it was buried nose first in the ground, lighting up the whole valley where I had crashed," he said. "I was hoping very strongly that someone would notice the unusual light display." Despite the bike being lit up for the next 13-and-a-half hours before the petrol ran out, no one came. "When I got closer to the bike I tried to use Bluetooth on the helmet to call for help, but there was no network for anything, even emergency calls," he said. "As the night wore on there was intense heavy rain, a couple hours of sleet, half-an-hour of snow, another couple hours of sleet and more rain. "The morning dawned, colder than the previous night and the wind was really strong. "I felt that my only hope was that if it was a reasonably blue day, I was going to set fire to the bike, but the wind was so strong the smoke wasn't going to rise above the tree tops." Mr Bowring said things that saved him were his multilayered motorcycle clothing, which was reasonably waterproof, a 500ml bottle of water, an emergency space blanket and pain tablets. "I knew that to minimise heat loss I had to leave my helmet on, keep myself as vertical as possible and was massaging my legs," he said. "Because I was so cold I also started hallucinating, from about five hours after the accident, like children's toys, people's faces, Mac trucks, and I could hear people talking - I pulled my helmet off to check." Mr Bowring said by about 2pm on Friday afternoon he had resigned to the fact he was going to die. "Then this voice said 'how are you going mate?'" he said. 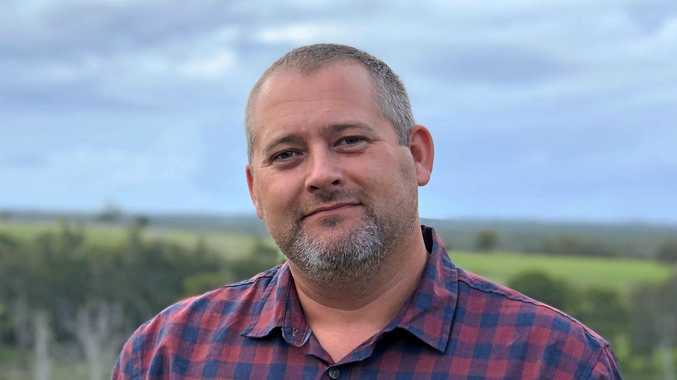 A local farmer and volunteer firefighter, Simon, had come for a walk with an idea that Mr Bowring, who had been reported missing by his family at 4am that day, would be in the area, and emergency services were on the scene about 15 minutes later. With great difficulty and a lot of discussion, Mr Bowring was put on a stretcher and dragged up the hill and then a ladder to safety, thanks to the help of emergency services, and driven to Warwick hospital. 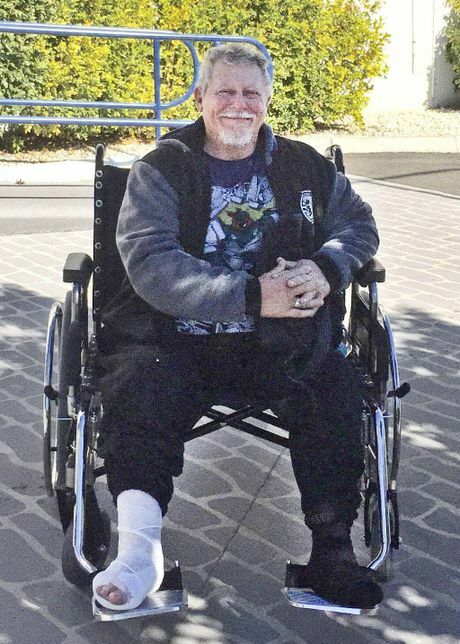 He was treated for his fractured ankle and hypothermia before being released on Saturday morning much to the delight of his wife Louise, his two sons, three step children and seven grandchildren. Mrs Bowring had spent the whole day, with friends and family, scouring the country for her husband, talking with local people, businesses and emergency services. The couple had only moved to Queensland from Sydney in December and this was Mr Bowring's first trip to Killarney, adding that a meal of beef cheeks he had at the Spring Creek Café was what provided the energy for his ordeal. "The police said that of the people that have been lost as long as I was, 90% would be dead," he said.